Considering the success of last year’s conference, we decided to host our second annual professional event regarding 3D visualization and printing. This event is unique in Central Europe. The invited lecturers are prominent professionals representing their scientific or artistic work. Lab A116 of the Faculty of Engineering and Information Technology, University of Pécs - Pécs, Boszorkány str 2. Prof. Zoltán Csernátony is the head of the Department of Orthopaedic Surgery and its Laboratory of Biomechanics at the University of Debrecen. As an orthopaedic surgeon his main research field are hip arthroplasty, spine surgery, biomechanics and the surgical application of 3D printing. Several innovative developments are attached to his name like the CAB spine implant system, implants for revision hip surgeries and numerous medical device developments for postoperative rehabilitation. He is one of the pioneers who initiated the application of 3D printing in the field of surgery in Hungary. He and his team use the technology for surgical planning, fabrication of custom made bone substitution implants and for educational purposes. I’ve been working with my own IT service company since 2006. I’ve graduated as a software and hardware engineer and have been using these skills in 3D printing also in order to create prosthetics for kids. For prototyping my new ideas, developing IOT solutions I use my own two 3D printers. E-Nable was present at an exhibition I’ve also participated two years ago and met them there. Soon I’ve started working together with Joe Cross and since then I’ve succeed to hand over four prosthetic hands and a prosthetic arm to children. Has been working in 3D printing industry for more than 3 years. Previously has worked with several successful startups. Currently deeply involved in medical applications of 3D printing and pursuing creation of new applications through 3D scanning and software development within WiDE project. Prof Judit E Pongrácz graduated as a Biochemist in Debrecen then completed her PhD in Immunology. She has been working at Pécs University since her return to Hungary from the UK where she spent 15 years as a senior research scientist. Ever since her return in 2003 she relentlessly works to implement biotechnology teaching programmes and research ideas. Her efforts have been recognized by various awards, including the Women in Science: Excellence Award in Biotechnology (by the Women in Science Foundation, Hungary), the Szentagothai Experienced Scientist Award (National Excellence Programme), I-st prize for Innovation (by the Hungarian Academy of Sciences and Industrial Board) etc. She also co-authored and edited the award winning book of “Medical Biotechnology” (The British Medical Association). Her research in pulmonary medicine has resulted in high quality research publications and lead to translational research directions. Prof Pongrácz also has research cooperation all over the world including Chicago, Boston (USA), Birmingham (UK) and London (UK), etc. Prof Pongrácz established the first spin-off company of the University of Pecs, the Humeltis Ltd that uses 3D tissue cultures and tissue printing in medical diagnostics and drug development services and attracted venture capital investors. Prof Pongrácz is the head of the Department of Pharmaceutical Biotechnology, School of Pharmacy and the Wnt signalling Research Group in the Szentagothai Research Centre, University of Pecs. MSc. José Manuel Baena, research associate "Advanced therapies: differentiation, regeneration and cancer" IBIMER,CIBM, Universidad de Granada. Founder of BRECA Health Care, pioneer in 3D printed custom made implants for orthopedic surgery, and REGEMAT 3D, the first Spanish bioprinting company. Expert in innovation, business development and internationalization, lecturer in some business schools, he is passionate about biomedicine and technology. In his free time he is also researcher at the Biopathology and Regenerative Medicine Institute (IBIMER). Ricky is a Co-Founder of BioBots, a Philadelphia-based startup that is revolutionizing biological research by building tools to make it easier to engineer biology. BioBots is specifically beginning by creating premier bioprinters that can print living tissues. Ricky built the prototype BioBots 3D bioprinter in his dorm room after he was frustrated by the high cost and inaccessibility of equipment. As CTO, Ricky continues to lead the development of next generation products by uniting robotics, software, and biological engineering into one experience that is pushing humanity forward. His revolutionary vision for BioBots continues to shape the future of bioengineering and bio-fabrication. I am a physical therapist with a PhD in Neuroscience. I have worked clinically in both private practice and hospital environments before moving to the United States to study computational neuroscience at Harvard Medical School and MIT. I then accepted a post-doctoral fellowship at New York University, designing prostheses for Brain Machine Interface devices. I am currently an Assistant Professor of Rehabilitation Medicine at Weill Cornell Medical College, and the Director of Telemedicine and Virtual Rehabilitation at Burke Medical Research Institute. In this position, I work to develop low-cost and accessible healthcare solutions for individuals in need of better healthcare accessibility, including a role as a site Principal Investigator for a multi-site, NIH-funded investigation of the role of telemedicine in the rehabilitation of sub-acute stroke survivors. I am the Chair of the Research Committee for the Telehealth Intervention Program for Seniors (TIPS), a Westchester county initiative that provides telehealth monitoring up to 750 elderly individuals with chronic conditions. I consult for Red Bull High Performance, using state-of-the-art technology to monitor and enhance athlete performance. I am also the “Chief Mad Scientist” (Chief Scientific Officer) of Not Impossible Labs, a group that crowd-sources accessible technological solutions for high-impact humanitarian problems. 3D printing is an innovative, additive manufacturing process, which is not only rapidly gaining acceptance in the high-tech industry (e.g. aerospace, automotive), but also in healthcare. Computer-assisted planning of surgical procedures and the fabrication of anatomical 3D models and patient specific implants is a well-established process at the presenter’s Department of Cranio-Maxillofacial Surgery. Surgical planning and medical 3D Printing are firmly integrated technologies in the clinical course of treatment. In his presentation, Dr. Florian Thieringer will talk about his experiences in 3DP in Cranio-Maxillofacial Surgery at the University Hospital Basel, Switzerland and give a short outlook, which innovations are ahead of us in this exciting field of high-tech medicine. Since 2007, I am engaged in the distribution of 3D tools (first of all: 3D Systems solutions), and the sale of 3D services. Right now, I am representing the 3DZ group (the world’s second largest 3D systems distribution) in Hungary. Vittorio Satta holds a Bachelor Degree in Electronic Engineering at the University of Cagliari (Italy) and a Master Degree in Management Engineering at the University Carlo Cattaneo - LIUC of Castellanza, Varese (Italy). He’s in charge of the Learning and Education Activities for the MakerBot Innovation Center, placed in SmartUp - LIUC. Between 2009 and 2014 he participated and organized several roadshows for the promotion of the LIUC University in the italian territories. Researcher and Freelance Consultant involved in the field of additive manufacturing and rapid prototyping. He is interested in discovering new learning methodologies and disruptive applications using new advanced “tools”, for example 3D printers, openhardware devices, opensource software and so on, and he contributes the Digital Do It Yourself European Project (http://www.didiy.eu/people/vittorio-satta). After several years of collaboration, in 2015 he joined as a Contract Professor for the Management Engineering Faculty in LIUC (http://my.liuc.it/persone/persona.asp?ID=1712). Member of the Scientific Committee of the RoboCup Jr Italia, an italian network of High Schools involved in Robotics (http://www.robocupjr.it/4/?page_id=3968). George Falk was born in Hungary in 1951. He is Honorary Associate Professor of the Budapest University of Technology and Economics based on his pioneering and educational work of introducing and implementing 3D Printing technologies in Hungary. Having a degree in mechanical engineering and economics he started his professional career in the Institute of Engineering Technology in 1975 in the field of computer-aided-engineering and computer-aided-manufacturing -CAD/CAM - activities. As a result of his Senior Researcher work he wrote several articles and studies in the field of Additive Manufacturing and 3D Printing. From 1989 he is working in VARINEX Inc. in his own company together with his business partner George Voloncs. VARINEX is the market leader and the first 3D Printing company in Hungary since 1998. Due to this pioneer activity establishing the first Additive Manufacturing Services in Hungary VARINEX received a State Innovation Prize in 2000. He regularly holds lectures in Hungary and abroad. He has given lectures on theory and practice in 3D Printing to more than one thousand students. He regularly takes part in the work of the state examining board of the Budapest University of Technology and Economics. He is the President and 3D Printing Business Unit Manager at VARINEX Inc. and he is extensively exploring and promoting the integration of 3D modeling and 3D printing technologies in the mechanical engineering practice and other important fields like dental and medical applications. He also develops new applications like direct tool making using 3D Printing for different tooling areas. Amy Karle is a new media artist who connects the body with technology to output art. She creates devices, interactive installations and performances connecting physiology and consciousness with technology; expressing biofeedback and emotional sensations in visual forms so that we may visualize the mind-body connection and the nature of consciousness, even learn to reprogram it. Amy Karle attended Alfred University and Cornell University, where she received degrees in Art and Design and Philosophy. Amy is co-founder of Conceptual Art Technologies and is the developer of registered active patents, servicemarks and trademarks in medical and technology categories. Amy Karle’s mission is to raise consciousness and positively impact others with her work. Amy currently works as a full-time artist both expressing ephemeral and spiritual experiences in visual forms and designing technologies to improve the body and functions of the human. The long-term goals of her work are in healthcare and mind-body medicine. István Hatos is head of the DMLS laboratory at the Széchenyi Istvan University of Győr. The first industrial direct metal laser system was installed at the UNI in 2011. He is working and teaching manufacturing and 3D technologies like CAD/CAM, 3D scanning and 3D printing. His most important research field is the hybrid laser sintered structures. Sándor Manó is the technical-engineering leader of Laboratory of Biomechanics at the University of Debrecen. His main activities directly connect to the 3D techniques like 3D design, 3D printing and 3D scanning. His most important research field is the custom-made implant design and fabrication based on 3D printing, but he participates in medical device development projects as well. Besides, as the quality manager of the accredited Biomechanical Material Testing Laboratory he has significant experience in the field of biomechanical and implant mechanical tests as well as tests of plastic and other base materials used by 3D printers. Daniel G. Nemet is an engineer and economist turned entrepreneur, founder of Ususty, a sustainable innovation agency. Ususty’s mission is to facilitate the shift towards the sustainable present, through developing high-impact technology based solutions for existing businesses. Ususty delivers the business case of sustainability with cost-effective IOT solutions, that increase efficiency and differentiate brands while delivering real social and environmental impact. Furthermore our company assists clients to develop sustainable products and services which can turn into business successes. Daniel have lived in Brasil, Chile, Australia, New Zealand and Mexico in the past five years. He is a creator, traveller, ex-athete turned entrepreneur and hobby philospher with many successes and just as many failures. M. Teresa Fernández-Sánchez, Professor of Biochemistry and Molecular Biology at the University of Oviedo (Spain) is a member of the Institute of Biotechnology of Asturias (IUBA). She graduated in Chemistry and post-graduated in Biochemistry at the University of Oviedo, and worked as a post-doctoral fellow at the National Cancer Institute (NIH, USA). At present, she is in the Department of Biochemistry and Molecular Biology. Her research activity focuses on the study of the biological action of marine toxins and seafood contaminants on neuronal survival and functioning, and in particular the effects of subtoxic long-term exposures to these compounds on the occurrence of neuronal apoptosis and oxidative stress, using primary cultures of central nervous system cells. The group has recently started using the microelectrode array (MEA) methodology for the analysis of extracellular recordings generated by in vitro neuronal networks growth on microelectrodes. Her academic activity has been strongly oriented in the last few years to establishing at the University of Oviedo studies involving active learning methodologies and a high degree of internationalization. Thus, she actively participated in the organization of a new degree in Biotechnology (2009), and the organization of the Master in Biotechnology of Environment and Health (www.unioviedo.es/MBEH), an international programme of roblem-based learning methodology, established at the University of Oviedo in 2011, that she coordinates ever since. Responsible for many international agreements for the exchange of students and staff with many Universities worldwide, she has lectured in several European Universities She is presently involved in the organization of the multinational joint master programme Innovation and Business in Health Biotechnology, IBiHB, involving 7 European partners. Prof. Fernández-Sanchez is since June 2016 Director of the Area of Europe at the Vice-rectorate for University Extension and International Development of the University of Oviedo. Krisztian Kvell MD PhD Dr. habil. Fogorvosi diplomámat 2001-ben szereztem a Pécsi Tudományegyetemen. Ezt követően a Fogászati és Szájsebészeti Klinikán kezdtem el dolgozni a Fogpótlástani Tanszéken. Jelenleg is ezen a tanszéken dolgozom, illetve a Fogászati röntgen osztály és a preklinikai részlegen vagyok megbízott részlegvezető. Érdeklődési területem a digitális technológiák fogászati alkalmazása a digitális adatfeldolgozástól az anyagokon át egészen a kész szerkezetekig. Manager Dental - Trade Kft. 2004-ben szerezte meg fogtechnikusi végzettségét, mely után budapesti laborokban helyezkedett el, ahol főként hagyományos technológiával dolgozott. 2011 óta CAD/CAM menedzserként dolgozik a Dental-Trade Kft-nél, ahol a digitális technológia szakértőjévé vált. A koppenhágai székhelyű 3Shape oktatóvá képezte ki, évente több gyakorlati kurzust tart CAD/CAM témában. Németországban (Concept Laser, RapidShape, BEGO), valamint Olaszországban (DWS Systems, CimSystem SUM3D) cégeknél is részt vett több gyártói tovább képzésen. A Cad/Cam eszközök és szoftverek termék támogatásával az évek alatt átfogó gyakorlati tudást szerzett meg. Több magyarországi egyetemmel közösen végzett kutatás közreműködője, melyek részleteit szakmai konferenciákon mutatja be, illetve szaklapokban publikálja. Dr Gasz presently work as cardiac surgeon and also he is engaged in research work in University of Pécs associated with 3D visualisation and medical 3D printing in surgical planning. His research field involves several novel aspects of application of medical 3D modelling and rapid prototyping in surgical planning in area of cardiac, vascular, thoracic, abdominal surgery and otolaryngology. The team in University of Pécs also work in development of severeal aspects in surgical skill training. The professional work of the team engages analysis of orthopaedic, vascular surgical, cardiac surgical issues. Ködmön István – Herendi Porcelánmanufaktúra Zrt. A 3D-vel Nyomtatott Tárgyak Különböző Színterelési Lehetőségei, Különös Tekintettel a Kerámia Anyagokra. Print, Build a Prosthetic Hand for a Child! BioBots creates 3D bioprinters and bioinks that are unleashing the biological revolution. The HERZ Group develops machinery, devices and accessories for plastic and plastic-welding technologies, and industrial HHVAC. Using 50 years of experience, and a crew specializing in this field, the HERZ Group created a trustworthy and world-renowned trademark. They are offering an exceptionally wide range of products – e.g. automatic hot air and hot wedge welding machines, manual welding extruders, industrial air heaters, etc.. HERZ does not build machines for end users, they’re building with them. Their objective is to provide machinery to customers, which is efficient, trustworthy, and affordable. Besides being a distributor, HERZ Company recently showed significant improvement in Hungary by stepping up in the market as a manufacturer of products as well; making filaments (PLA, ABS, PMMA, HIPS) for 3D printers, and constantly testing new materials for industrial use. The 3-production-line manufacturing hall has been added in 2013 to their new building finished in 2005. In 2016, HERZ has acquired the adjacent 4000m2 of land, on which they plan to erect a 15-production-line manufacturing hall. All interested are welcome to visit the 2nd International Interdisciplinary 3D Conference in Pécs, where György Falk, Director of the 3D Printing Business Unit of VARINEX Zrt, will present the novelties and the future of 3D printing. Computer Aided Design, Manufacturing and Analysis always played a central role in our company’s life. 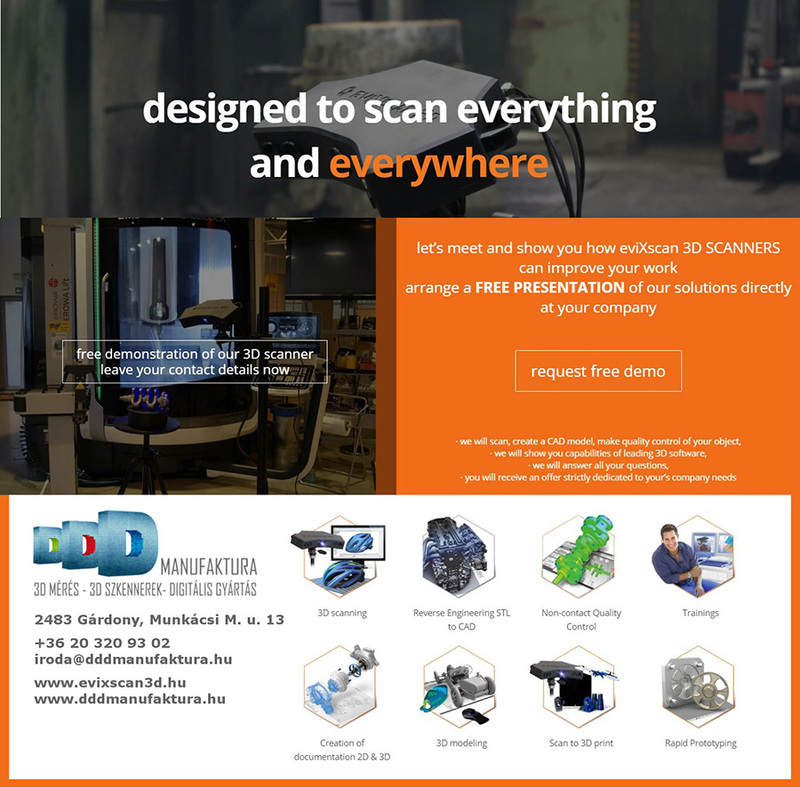 Our activities include virtual product development, computer aided engineering and architectural design, CNC machining, engineering simulations, digital mapping, and we were the first company to start 3D printing and rapid prototyping services at the end of the 90’s. During the 2nd International Interdisciplinary 3D Conference, you will find it worthwhile to visit our booth, where you can acquaint yourself with our 3D printing technologies and industry novelties. Should you decide to visit our 3D printing site as well, you will have a chance to walk through our digital factory – which opened in May 2015 as the first of its kind in Hungary –, and our 3D printing technology centre, where you will be introduced to the different printing procedures and get a chance to observe our professional industrial 3D printers in operation. Sponsored by the GINOP 2.3.2-15-2016-00022 grant. This event is part of the University of Pécs 650 Jubilee program series.